Pablo Hernandez is a sunny guy. It’s one of the first things you notice about him when you meet him: the merry, guileless grin that always seems to light up his face. He might have been born with it. After all, Pablo hails from Valencia. It was there, in the endless summer of one of the balmiest parts of Spain’s Mediterranean coast, that he carried on his family’s skydiving legacy to become one of the biggest names in canopy piloting. Many years later, the erstwhile fighter pilot brought his two sons to a civilian skydiving center. His father and uncle became skydivers. Eventually, Pablo’s dad became an instructor. Pablo’s skydiving-instructor dad was a popular, busy, mobile kinda guy. Since early childhood, Pablo traveled alongside him. “We were always traveling for skydiving. Every weekend,” Pablo remembers. Raised on the dropzone, as Pablo puts it, he was “the classic dropzone kid.” He’s been packing parachutes since age 11, hustling for ice cream money. The situation escalated quickly. At age 14, he did a static line course — instructed by good ol’ dad. “It was completely illegal,” Pablo laughs. Pablo’s father rented a Cessna 182, attached the static line to the seat of the aircraft and pushed me out of the plane. He did five or six static lines and a couple of freefall jumps from 5,000 feet. Pablo did just great. His dad decided that the teenager was ready for the bigtime: Twin Otter time. The pair headed for a big, familiar dropzone in the south of Spain with a fake ID and a logbook that clocked a hundred-plus jumps. Since Pablo’s dad was so well-known and well-liked, nobody hit the red button. We did that for a few jumps, and suddenly, I was a skydiver! Photo courtesy of Juan Mayer. Pablo thrived on that accelerated schedule. He became a videographer at 15. By age 18, he was an AFF and tandem instructor. Photo courtesy of Max Haim. Unfortunately, Pablo’s turbo-charged start had a less-shiny side: He was an outlier. At 18 years old, he already had a good 3,000 jumps in his logbook. He was a good freefly athlete. He wanted to compete. But the talented teenager couldn’t, for the life of him, find another jumper in Spain whose age, skills and total dedication to the task were similar enough to make it work. Then, one day in October of 2004, legendary canopy pilot Brian Vacher — a British jumper who became Pablo’s teammate on the PD Factory Tteam in 2009 — came to Pablo’s dropzone to teach a canopy course. The cocky teenager signed up. “I did the course in a very arrogant way,” he adds, laughing, “because I was a teenager, and I thought I knew everything. I probably signed up for the course more to show off than to learn, really. But then it changed the way I saw canopy piloting. Over the course of the skills camp, Brian did a few swoops to demonstrate the discipline. Suddenly realizing he had a lot of ground to cover, the young Pablo hung out with Brian quite a while over the weeks he was in residence. They talked about Brian’s upcoming travel to the 2nd World Cup of Canopy Piloting in Lake Wales, Florida, six months ahead. Pablo set to work immediately. He found a ragged-out JVX and trained hard for those six months. Against all odds: Pablos first competition was a World Cup… And he won! When he arrived, he immediately set upon a tsk-tsking Brian to explain and re-explain to him all the rules: accuracy rules; scoring points; fouls. When the day came, he competed in the intermediate class. And he won. That was the official starting point of Pablo’s star-studded career. It was there in Lake Wales, after all, that Pablo first met all his future PD Factory Team members. He met Jay Moledzki; Ian Bobo; Jonathan Tagle; John Charles Colclasure; Shannon Pilcher. As athletes and as people, they inspired him. So did the discipline iteself. Simply put, it solved all his problems. Pablo immediately worked to leverage that first gold medal in order to advance as an athlete and to forge the sponsor relationships he still treasures. He got support from Sunpath straight away, then PD — both, brands he has represented for decades. Also, the dropzone he was working for at the time gave Pablo free training jumps. He racked up 2,000 jumps the first year he was sponsored. “I did a few years like that, training, training, training,” Pablo remembers. Soon, Pablo started traveling outside of Spain to teach and coach canopy control — mostly in Canada, because he speaks French. (The family lived in French-speaking Africa for 6 years of Pablo’s childhood.) He did coaching summer tours, traveling around different dropzones on the east coast of Canada, Quebec and Montreal. “That was the first time I realized I could travel the world sharing the knowledge and teaching other people how to fly parachutes,” he says. In 2009, Pablo joined the PD Factory Tteam. He’s been team captain for the past three. 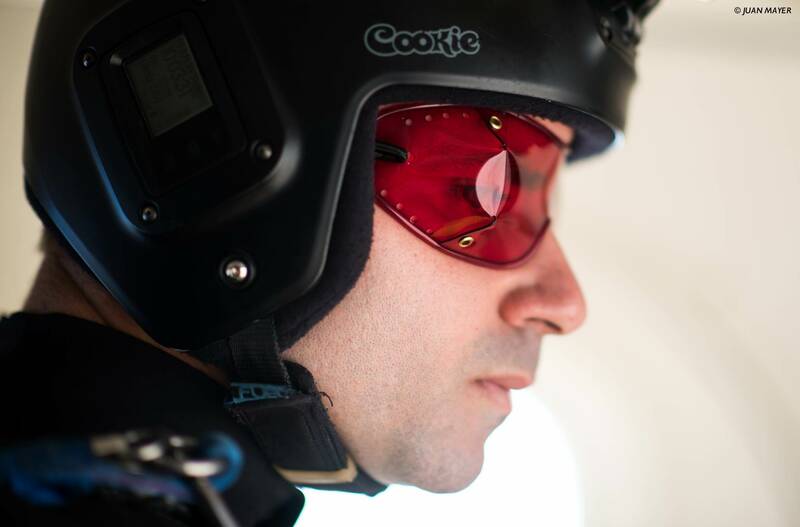 Right now, Pablo’s logbook is getting close to 16,000 jumps, and he has spent the last full decade with a laser-focus on competition, fighting for that medal, representing the PD Factory Team in World Championships. Pablo has attended a total of 18 world meets, including world championships, world cups, World Games and World Air Games, over the course of which he has picked up 25 FAI medals, three European Championships and two world records. 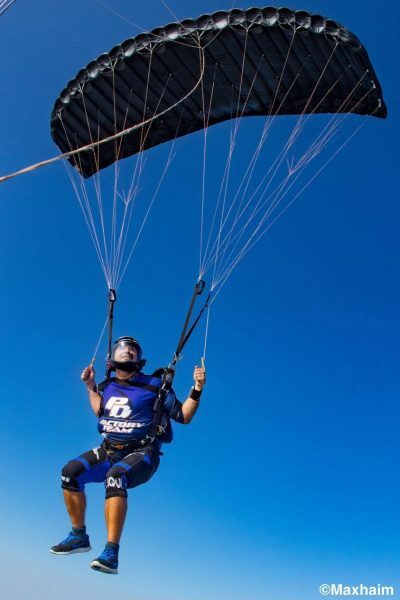 When he hasn’t been competing, he’s been teaching new competitors the ropes, running the Flight-1 Canopy school at Skydive Dubai for six years. Now, he’s almost finished with that contract. And, as he’s always in search of a new challenge, Pablo is excited about the new role he’s taking on: heading up the Special Projects department for Skydive Dubai. 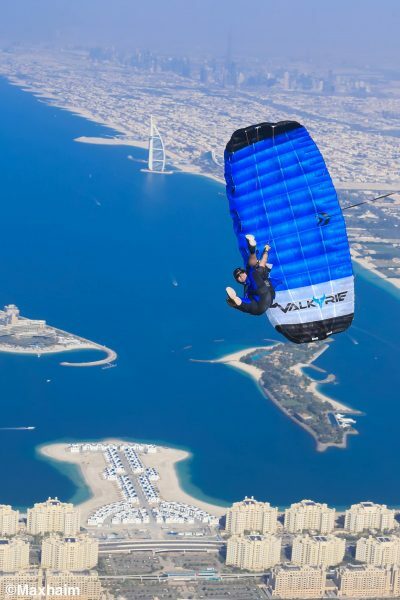 He’ll be organizing, supervising and coaching the demo team of Skydive Dubai to organize demo jumps in Dubai — and also to organize TV commercials and commercial requests for local skydiving-related productions. Between the Special Projects department and the rejuvenated PD Factory Team, Pablo is getting ready to dig into a lot more public-facing work. Make no mistake: this will be no desk job. Pablo describes his current situation as something of a “retirement” from the classic competition arena: distance, accuracy and speed. While he remains “very much interested” in the freestyle side of the competition and intends to stay active in that aspect for the foreseeable future — competing at the first World Championships of Freestyle Canopy Piloting this year in Poland, for instance — he’s happy to see the three core events of canopy piloting in his rear-view mirror. While the focus of Pablo’s jumping leans heavy on the canopy side, he insists that he’s always down for a freefall — and his logbook proves it. It’s because of that that Pablo is the proud owner of a wingsuit CYPRES. CYPRES is proud to have Pablo Hernandez’s epic back, and to have a front-row seat for this exciting new chapter in his high-flying life at the forefront of the Dubai airsports scene.